BOSTON, Massachusetts, Nov 5 2012 (IPS) - Local and state campaigns have become a moneyed battleground this year for corporations and special interest groups hoping to sway the results of elections for local and state offices on Nov. 6. From California to Texas to Florida, global businesses as well as ideological organisations and extremely wealthy groups have helped channel more than 1.6 billion dollars through political action committees and into local campaigns and issues this year, according to the National Institute on Money in State Politics, a non-governmental organisation (NGO) that analyses state campaign-spending reports. Some of the cash went into campaigns of local lawmakers. Other amounts supported campaigns for judges. More than 6,000 legislators are running for election Tuesday, according to the National Council of State Legislators, with most relying on private funding. Campaign money can be difficult to track, since states set their own campaign finance laws, and money flows in and out of state and federal political parties, political action committees and non-profits and into campaigns and issue advocacy. This “outside spending” increased 38 percent between 2006 and 2010, according to the National Institute on Money in State Politics. Spending by candidates increased 19 percent during that time, it found. Large chunks of special interest money also were directed at state ballot measures, which are decided by voters in individual states. 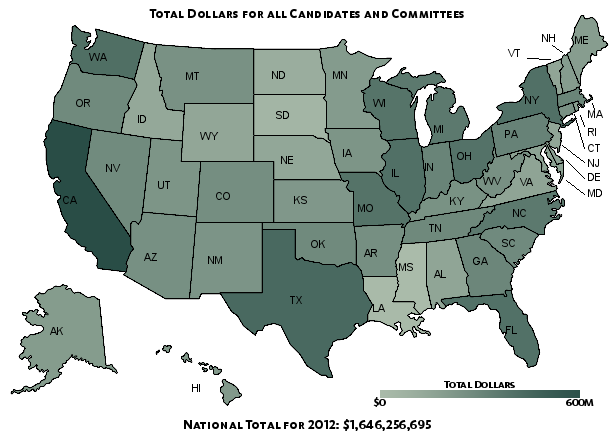 This year, 38 states have ballot measures, according to the National Council of State Legislatures. Nowhere is the impact of moneyed interests more obvious than in California, where 570 million dollars have been spent leading up to Tuesday’s elections. Of that amount, 421 million dollars have gone to groups arguing for or against ballot measures, including those related to tobacco and genetically modified foods. A California proposal to raise taxes on a package of cigarettes by one dollar was voted on and narrowly defeated earlier this year during the state’s primary election. Pro-health groups spent 18.2 million dollars advocating for the measure, but tobacco companies, including global giants Philip Morris and Reynolds, spent 46 million dollars to bolster their pro-tobacco stance through advertisements. A measure to label genetically modified foods has pitted consumers, organic farmers and businesses, who have ponied up 8.2 million dollars, against well-armed agricultural corporations and supermarkets, which have spent 48.7 million dollars. The biotechnology giant Monsanto has contributed 7.1 million dollars to defeat the labelling proposal, followed by Dupont (4.9 million) and Pepsico, (2.1 million), among many others. In Texas, where donations to this year’s candidates exceeded 113 million dollars, some individuals and businesses stood out for their especially large contributions to the electoral process. Bob Perry, the Houston real estate mogul who helped bankroll presidential candidate Mitt Romney, mainly by donating more than 10.7 million dollars to the Super PAC Restore Our Future, is one, according to the Centre for Responsive Politics, a Washington NGO that analyses campaign finance reports. This year, Perry has made a mark of 2.4 million dollars on Texas politics. More than 72.5 million dollars were dumped into Florida campaigns for 2012, where pro-business special interests figured prominently. The utility company Progress Energy gave the most money – 709,000 dollars – to candidates, about 90 percent of them Republican. Other major corporate donors include private health insurance company Blue Cross Blue Shield, which gave 648,000 dollars, and the Walt Disney Company, which donated 497,000 dollars. Multi-billionaire conservative Sheldon Adelson, a Las Vegas casino magnate, also got involved in Florida politics; he gave 250,000 dollars to the state Republican Party. “What we shouldn’t have is corporate financing of elections. Corporations are not people. They don’t vote and should not be involved in selecting our government,” said Craig Holman, a government affairs lobbyist for Public Citizen, a consumer advocacy NGO in Washington, DC. Political action committees (PACs) and political non-profits also are influencing politics in Florida, as they do in many other states. Three Florida Supreme Court justices are at risk of being unseated by conservative groups angry about the justices’ support for President Barack Obama’s 2010 healthcare law. According to an investigation by the Centre for Public Integrity, the attack against the judges is being waged largely by two well-funded ultra-conservative political organisations, Restore Justice 2012 and Americans for Prosperity, funded by the conservative billionaire Koch brothers. A third politics group, Defend Justice from Politics, is backing the judges. How much money is involved in the judges’ re-election campaigns is unclear, however, due to Florida’s murky reporting requirements. Grassroots efforts to expel money from politics are underway in a number of states, including New York. And a number of states including Arizona, Connecticut and Maine have already tightened up their campaign finance rules, mostly due to citizen efforts. A sweeping law to reform relaxed campaign finance rules in Massachusetts was passed by citizens in 1998, but was repealed by lawmakers. Some candidates are taking matters into their own hands by refusing corporate money or in the case of one candidate running for the Massachusetts state house, refusing money altogether.